Dean Austin insists it is simply a case of ‘as you were’ as he prepares for his first season as a Football League manager. Aside from his five matches as caretaker boss of the Cobblers at the back end of last season, the 48-year-old’s managerial experience is limited to eight months in charge at non-League Farnborough, 13 years ago. He has been entrusted with the task of trying to steer Town back into Sky Bet League One at the first attempt after their relegation in May, with chairman Kelvin Thomas handing him a two-year deal to take the managerial reins. It is undoubtedly a big challenge for Austin, but he is taking everything in his stride and insists he is not approaching the new campaign any differently to if he was still an assistant manager, or first-team coach. “It is no different, and it is not going to change me as a person,” said Austin, who welcomes his players back for pre-season training on Monday. “It’s not going to make me act any differently in terms of how I treat the players, because I always feel that I treat people with respect. “So I am not going to treat the players any differently, I am not going to coach the team any differently to how I would coach it if I was the first-team coach. 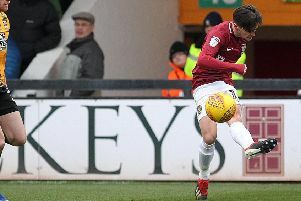 Austin and the Cobblers found out on Thursday morning that they will start the new season on August 4 with a home game against Lincoln City, who were beaten play-off semi-finalists last month, losing to Exeter City. It’s a tough start for Town, who travel to Carlisle United the following week, starting a run of four away games in five. A midweek trip to Wycombe Wanderers in the Carabao Cup follows the Carlisle match and Cambridge United then visit the PTS Academy Stadium on August 18, before a lengthy midweek journey to Morecambe on August 21 and a trip to Colchester United on Saturday, August 25. Despite the testing opening month, Town have been made second favourites to win the league two title, and although Austin won’t be making any bold predictions, he is confident in his and his team’s ability. “I think we have a decent opportunity with a decent group of players,” said the Town boss. “I expect us to be competitive, as of course our fans will, and I am looking forward to the challenge.